Stephen Hay tackles the question in this week’s A List Apart. This week’s New Yorker shows how art direction provides a framework for understanding written content. The zeldman.com redesign continues, with a new feature for laptop users and other adjustments. In this week’s issue of A List Apart, for People Who Make Websites, Cinnamon Interactive’s Stephen Hay introduces the principles and techniques of the art director, and shows how art directional concepts can shape memorable user experiences. This New Yorker issue contains Seymour Hersch’s story on the torture of Iraqui prisoners at the hands of American soldiers in Abu Ghrai. The cover art prepares the reader for the horror within by bringing visual life to an anti-war cliche. It is as if Francis Bacon were painting an image out of Stephen King. 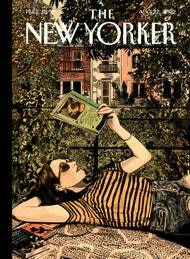 To put it mildly, this is not your typical (arch, detached, bemused) New Yorker cover. The shock of the image tells you, before you even open the magazine, that something new and terrible is contained in its pages. That is art direction. At its best, it makes you feel—and think. This week’s ALA went to press later than normal. We (the editorial and production staff) debated even running an issue at the end of a week in which hope seemed almost extinguished. Conducting business as usual seemed wrong. In the end, we met our weekly deadline because readers were counting on us. And because that is what we all do. We go on. Remaining entries in today’s Report should be viewed in this same light of resisting absurdity and despair. A few laptop users reported that the redesigned zeldman.com was hard to read on their low-contrast screens. The new contrast-o-meter should help. I planned to offer this little feature before relaunching, but you know what they say about launches and plans. In any case, it is here now. The book mini-site is finished, too, and there is also a front page image rotation script courtesy of Dan Benjamin (article, latest version). —Or would be, except that I’m going for that whole “untitled movie still” feeling, and the image at the top of this page captures it better than anything else I’ve come up with. So for now, one image, no rotation. Applicants must be comfortable in a team setting, as well as interacting and brainstorming with designers and art directors. Strong XHTML/CSS skills are required, but familiarity with “traditional” tables-based markup is also needed (to service legacy clients and sites). Experience working with ASP, JSP and other server-side languages is preferred. Basic Photoshop skills are a must, as is an awareness of cross-browser and -client compatability. Send resume and sample URLs to jobs@iconnicholson.com. Better design for a better world. Work in the standards-friendly digital division of the ad agency that produced Elmore Leonard.